Home » Life » Keep Your Eye on the Prize! When my son was in 4th grade he did what most 4th grade boys do in the summer. He played baseball. I noticed that he had a hard time hitting the ball so I did what any good father would do. I took him to the eye doctor. I mean, being my son, it had to be his eyes…right? Well his eyes were perfect. Then I noticed whenever he was in the batters box and the pitcher threw the ball to the catcher he kept stepping out of the batters box while swinging. This I could fix. I mean after all… I was a good father and I wanted to help my son….right?? 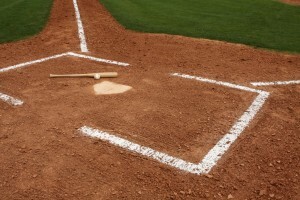 Several days in the early morning I would take my son to the baseball diamond when everyone else was asleep and we would work on “staying in the batters box.” But no matter what I tried…every time I threw the ball for him to hit, he did the very same thing. He backed up as he was swinging. I realized that until I could get him to lock his feet in the dirt he was never going to get a hit. I tried everything. I put blockades behind him. I promised him ice-cream Sundays. I even tried to bribe him with money but every time I threw the ball he started to back out of the batters box. So I pulled out all the stops. With fear and trembling Nathan asked, “You promise?” I said with 100% confidence, “Yes I promise.” (You can guess what happened can’t you?) I wound up, threw the ball and…SMAK!!!! I hit my son square in the back (only because he turned in on me). I have never heard my son yell so loud! …that rang through my ears the rest of the season. Nathan didn’t go out for baseball the next year. It wasn’t that my son didn’t keep his eye on the ball…He was simply afraid of it. And I am certain I didn’t help. As I write this article it is Thursday and this coming Sunday is Easter Sunday. My question for you is this. What are you afraid of? Because of Easter we no longer have to be afraid. Because of Jesus conquering the grave the victory is His. The next time you are afraid, look to the cross and to the empty grave! He has conquered death and everything that is evil and frightful! Easter is so much more than a religious holiday, for those of us who are true followers of Christ, it is our everything. If Jesus had not risen from the grave, we are following an empty religion. If Jesus had not risen from the grave, we are wasting our time. If Jesus had not risen from the grave, we are following a false god. If Jesus had not risen from the grave, we are misleading everyone we proclaim our message to. If Jesus had not risen from the grave, he was a liar and false prophet. If Jesus had not risen from the grave, there is no hope for humanity. But…Jesus did raise from the grave and the tomb is empty! Look to the cross and empty tomb my friend. He is no longer there! He has risen! He has risen indeed! Scott is the Pastor at Central Baptist Church in Owasso, OK.
Scott Carlson has written 0 posts.